Hooray, another wall finished! I must say off the bat that I am partial to this wall. I don't know that it was the most challenging to make, or the most flawlessly executed, but that wasn't what was I going for in either case. The wall was meant to capture a moment. The original image, from the gallery at AP, reminds me of my first dog, Hope, a Golden retriever, who passed away after a hard battle with cancer in 2006. So, the wall is pretty personal, and I am pleased with it because it reflects the emotion I was trying to convey: a quiet moment of peace between two souls. It's a tad grungy, a style we don't see all that often around anymore, but one that I think still has it's place. The image was vectored, and the side of her hair had to be rebuilt. The rest of the work was done in Photoshop, with lots of blending. Enjoy! U have my condolences about ur companion. I Had two dogs (not at the same time, though); the first one was six months younger than me, and I wasn't even one year old when he entered in our family. He was a black Labrador Retriever, and he was my best friend, following me everywhere and playing with me all the time. I was so sad when we had to euthanize him in 2001. Almost ten years later, I miss him... I guess that's why I especially love your wallpaper... I can feel your love for your dear companion, and that unique and strong bond between a human and his/her dog. 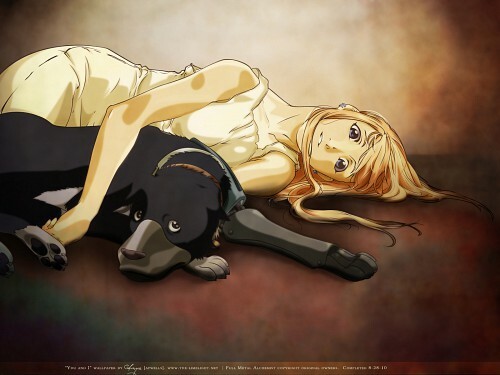 Besides, you used one of my favourite FMA picture ever. waaaaaaaaaaaao! This is very new for me... I've never seen this shot before... u did a great job... love it! Very Nice work. I am sorry to hear about your Buddy. Beautiful work! It makes the pic so lively and expressive, lots of emotions! Bravo ^^! So cute!I loved the feeling!